Moshi, TANZANIA, Nov 22 2010 (IPS) - With the snow-capped peak of Mount Kilimanjaro providing a backdrop under simmering tropical sunshine, a group of women in Mijongweni village break into song. The song, in Swahili, praises the benefits of protecting the environment and living in harmony with nature for the survival of generations; values vital to the survival of one of the rarest hardwood trees in the world, the African blackwood. While few people would recognise the tree, many across the world have heard its melodious tunes: the tree is a prized commodity for makers of musical instruments like flutes, clarinets and oboes, so much so that it is today the most expensive hardwood tree in the world, currently fetching up to 25,000 dollars per cubic metre. Though the blackwood tree is not endangered, it is being harvested unsustainably. A 1994 move to list it as threatened under the Convention on International Trade in Endangered Species was withdrawn, but observers fear it could become extinct within a generation or two if nothing is done to save it. “That is why I sprung to action to palliate the threat,” says Sebastian Chuwa, a Tanzanian botanist based in the northern Tanzanian town of Moshi and the founder and national patron of the Mali Hai Clubs of Tanzania. Mali Hai, Swahili for “living resources”, is a community-based organisation that sensitizes communities on environmental conservation through tree planting. “The mpingo tree is threatened because it is a slow-growing tree that takes between 50 to 70 years to mature and is being depleted at alarming rates,” he adds. Though Tanzania’s ministry of natural resources and tourism has slapped an export ban on mpingo, it continues to be harvested indiscriminately, especially in the southern parts of Tanzania that were, until recently, inaccessible. It is estimated that fewer than three million African blackwood trees remain, with most of the remaining stands in Tanzania and northern Mozambique. “I started collecting its seeds and initiated an African blackwood tree planting program here in Moshi,” notes Chuwa. James Harris, a Texan wood turner, and his wife Bette Stockbauer, who creates collectible wood art from many tree species, including the African blackwood, helped raise funds for the project in the US after watching a telecast on Chuwa’s work. The duo helped found the African Blackwood Conservation Project, enabling Chuwa to establish a major blackwood tree nursery. “The mpingo,” says Chuwa, “is a hardy tree that survives on very little water. It has tiny leaves that help against loss of too much water. Once the root system has been established, the tree requires little or no rainfall at all to mature. When he first set up the tree nursery in Mijongweni, Chuwa was able to plant 50,000 mpingo tree seedlings with the help of a local women’s group. Faraja is the Swahili word for hope, and the Faraja Women’s Group hopes to establish a green canopy of the African blackwood in their village and its neighbours. According to Yusta Tarimu, the leader of the group, its ten members managed to plant 35,000 blackwood tree seedlings last year and hope to plant 100,000 this year through community mobilisation in nearby villages. Apart from making some of the world’s best wind musical instruments, the African blackwood is also prized by wood sculptors. The Makonde sculptors of Tanzania make a handsome living from the sale of sculptures to tourists visiting the region. On a tour of their workshop in Moshi, I learn that most of the wood carvers have gained the skills from their fathers and uncles and are teaching their children as well. Chuwa has also donated some mpingo tree seedlings to the wood carvers who have planted them around their workshop. So far, the wood carvers have planted more than 3,000 African blackwood tree seedlings, a respectable amount considering they cut down about 1,500 mpingo trees every year. “I want them to plant 10,000 mpingo trees next year,” says a beaming Chuwa. Known as Bwana Mali Hai (Mr. Mali Hai) in the area, Chuwa has marshalled the entire Kibosho community at the foot of the Mt. Kilimanjaro into planting more than one million fast-growing trees in the region. This, he says, is critical for the survival of the sensitive Mt. Kilimanjaro ecosystem, which is currently paying a heavy price for climate change as scientists and environmentalists say the snow caps on Africa’s highest peak will vanish by 2020. 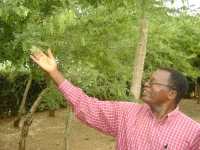 So popular is Chuwa that he was nominated and elected unopposed to represent Kibosho Division in the Moshi Town Council , a political position that he has exploited to advance his environmental conservation drive by introducing new legislation that criminalizes wholesale tree felling and encroachment on forest land. The new by-laws dictate that if someone wants to fell trees on his farm for commercial gain, then he has to replant at least ten more trees and give 10 percent of the earnings to a village account meant for development purposes such as building new schools, health centres and bursaries for poor, bright children from the village. From its humble beginnings in 1985, Mali Hai has become a movement to be reckoned with in the entire Kilimanjaro Province of northern Tanzania due to its elaborate environmental conservation sensitization program that has spanned the length and breadth of the entire regions and communities living in and around the Mt. Kilimanjaro ecosystem. Mali Hai are Swahili words that mean “living resources” since the trees that Chuwa helps plant are alive and can be used by the communities to improve their economic well being. According to Rodney Lema, the patron of Mali Hai in Singachini Village, the tree planting exercises have been so successful as they involve school children, many of whom have gone on to become environmental ambassadors in their respective villages. The massive tree planting exercise in the Mt. Kilimanjaro region was also a rallying call for Chuwa and residents to mitigate the negative effects of logging in the region. In recognition of his efforts to conserve the African blackwood and the entire Mt. Kilimanjaro ecosystem, Chuwa has received numerous awards, including the Associate Laureate Award from the Rolex Award for Enterprise Committee and the J. Sterling Morton Award from the National Arbor Day Foundation in the United States. *This story is part of a series of features on sustainable development by Inter Press Service (IPS) and the International Federation of Environmental Journalists (IFEJ), for the Alliance of Communicators for Sustainable Development (www.complusalliance.org).